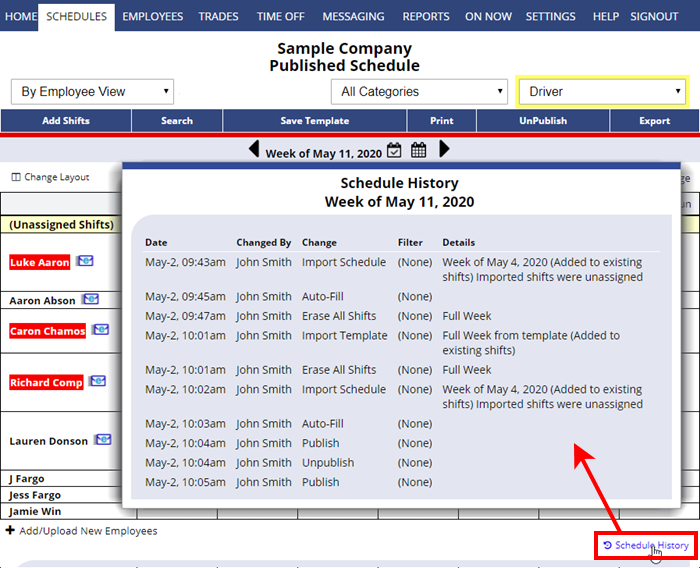 Managers (with permission to edit shifts) can click on the Schedule History link at the bottom of each weekly schedule to access a “Schedule History” window that shows details about when a schedule week was Imported, Cleared, Published or Unpublished and also who performed the function. This log includes all schedule changes at all times and does not age off after 45 days the way the Shift History does. Note: you can also track recent changes to individual shifts using each shift’s Shift History. Scroll to the bottom of the schedule and click the “Schedule History” link in the lower right.